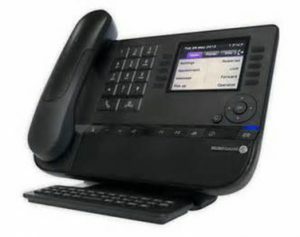 You are here: Home / Vendors / Alcatel-Lucent Enterprise / Voice Product Range / IP Premium Desk Phones 8028, 8038 and 8068. 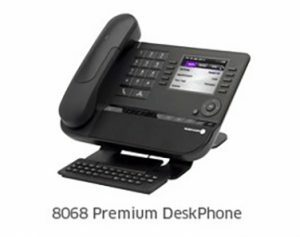 Alcatel-Lucent 8068, 8038 and 8028 Premium Desk Phones provide a comprehensive IP communications experience for great conversations, with an unrivalled level of comfort and an outstanding wideband audio quality either in hands free or using the comfort handset. These new innovative design sets come with several ergonomic enhancements such as adjustable foot stand, alphabetical keyboard, backlit display, dedicated function keys, user friendly navigator as well as a comprehensive set of accessories. All these elements facilitate the user’s business day-to-day tasks. All three Premium Desk Phones embed two Gigabit Energy Efficient Ethernet ports, one of which supporting Power over Ethernet. These elegant devices complement and leverage all the rich telephony capabilities of the Alcatel Lucent Enterprise platforms. Intuitive icons and soft keys. Compatible with IP-Touch 8 series. Easy installation, support plug and play provisioning. Easy to use with feature buttons and interactive soft keys. Offer the full range of telephony services found in Alcatel Lucent’s acclaimed communication servers — OmniPCX. Office RCE and OmniPCX Enterprise — unsurpassed in terms of functionality, features, reliability and quality of service. Improve employee efficiency and productivity. Leverages the installed base of Alcatel Lucent systems and solutions (OmniPCX, OpenTouch). Interoperability with survival router (embedded SIP Proxy) provide continuity of service with Alcatel-Lucent OmniPCX Enterprise systems. Premium Desk Phones Digital Premium Desk Phones.